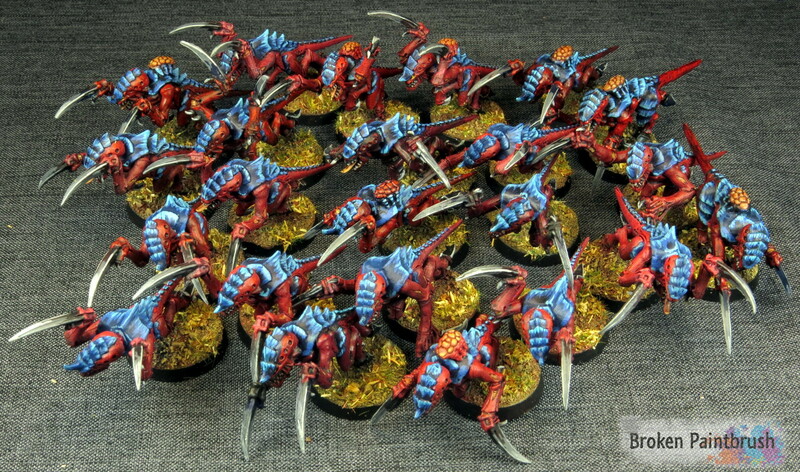 After finishing the Warriors brood, I realized that I didn’t have any pictures of the Tyranid Hormagaunts that so feverishly leap forward into the enemy. Obviously this isn’t run as a single brood, but rather two smaller ones, but I just lumped them together for the pictures. The actual models make up a combination of an old army box and a pile of sprues that I had given my brother in law. He then mashed up as many bodies and arms as he could assemble from the old bits so some of the Hormagaunts are actual Termigant bodies or Genestealer arms. 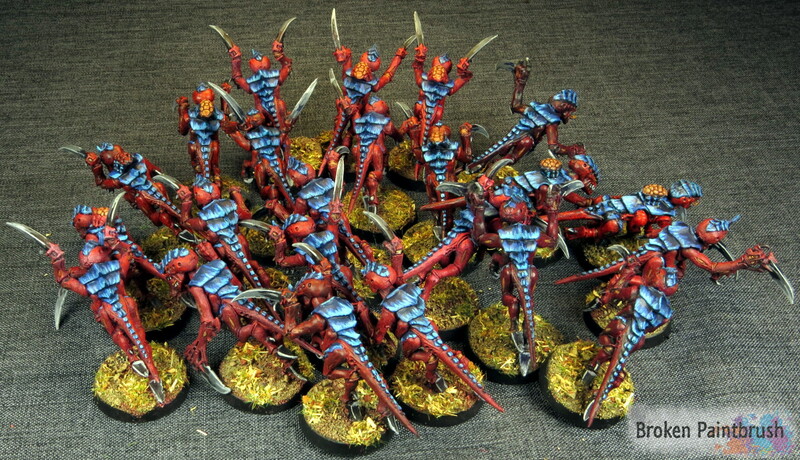 The difficulty with the leaping forward nature of the Tyranid Hormagaunts is that they tend to tip over at the slightest breeze. To prevent this as much as possible, we glued down layers of washer both under the base as well as on the top of some of them. The ones on top then got covered with thick layers of sand to hide them. Overall this made the models much more stable. You may have noticed that some of the Hormagaunts are a bit darker than the others, this was some of the evolution of the painting progress and some of the models that my brother in law actually finished before I helped out with the rest. So as much as I would love to build out the Tyranid Swarm box [on Amazon] which comes with another 40 Hormagaunts, 40 Termagants, one Carnifex, 4 Ripper Swarms, and 10 Gargoyles(!) for the sheer joy covering the table, I don’t think I could stand painting that many more Gaunts! When ever GW puts out these big box sets they kill my hobby budget because they are such a great deal. The swarm box is only $160 on Amazon but includes $200+ of models! 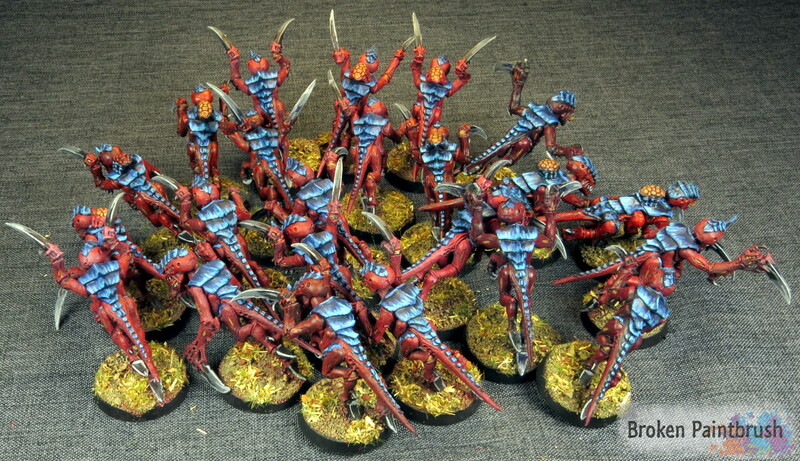 Perhaps at some point these guys will have a few dozen more brood-mates, but until then the Tyranid Hormagaunts will hunt on their own.